The first two games of the series started off wonderfully and got people talking about how the offense has already improved compared to the last several years. It couldn't get a whole lot worse, except there's a couple of teams in the majors that prove that no, it could have been worse. Thank you Houston Astros and Miami Marlins for giving us fans that we could pity while still mocking their individual teams. And then we had the last two games. Perhaps a little quick to judge the offense? Yes, I'm guilty of that also, but considering Mike Morse already has 4 home runs after 4 games I think we can be forgiven. We'll look closer at some things and not so close at others and what it doesn't mean for the season. I've already written about Opening Day and I'm not going to repeat anything. Felix was his normal dominant self and the offense was it's usual low scoring self. The second game Seattle won by a score of 7-1 and we saw Hisashi Iwakuma turn in a dominant start, one that we all hope can be repeated a few more times over the course of the next two, possibly three, years. He had all of his pitches working and was putting them where he wanted to put them. Kind of important when you're a pitcher. There was some concern about his strikeout totals in the spring, but managed to K 7 Oakland hitters in 6 innings. That probably won't become a typical thing for Iwakuma, but it's nice to know his ability to strike hitters out didn't vanish into the ether. The offense came alive in that game with Morse checking in with a pair of homers and Kyle Seager continuing where he left off last season. Perhaps most shockingly, Justin Smoak drew a bases loaded walk in the top of the 7th. To be fair, a couple of those balls weren't exactly close, but at least we know he has the ability to be patient. With any luck, he can keep that going the rest of 2013 and give us all a reason to hope he's not a lost cause. There's no point in looking at the stats only 4 games into the season, so I won't. I've been able to watch three out of the four games so far and some of the outs Smoak has made have been hit on the button, but managing to find fielder's gloves. The signs are there that he can at least hit for gap power and he's getting comfortable with his new swing. The last two games were a little rocky. In the Joe Saunders start, Seattle lost 6-2, but mainly due to the pitching. After the game, both Saunders and Charlie Furbush said that they weren't able to grip the balls very well and were slipping out of their hands. I remember thinking while watching them pitch that it looked like they had no clue where the ball was going to end up. I guess if the ball is slipping out of your hand, you really have no idea where the thing is going to go. 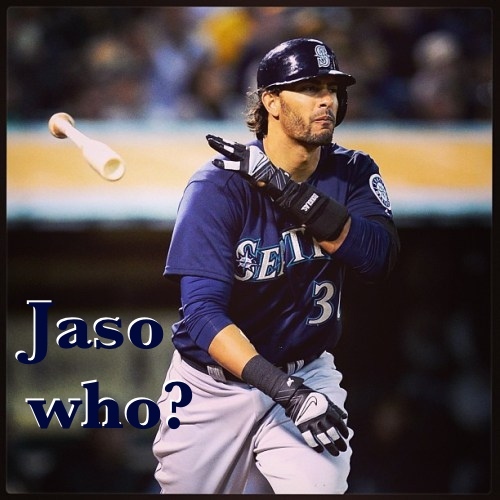 That was the theme for the night on the mound, for the Mariners anyway. Saunders barely made it out of the 4th inning, allowing 7 hits, 4 runs (4 earned), 4 walks and 3 strikeouts. Kameron Loe proved he could go two innings in relief, but three might be pushing it just a tad, giving up back to back home runs to Lowrie and Young. He managed to make it through three, however, and get the ball to Furbush. Furbush started off a bit rocky, nearly beaning Reddick until finally putting one in the middle of his back. It didn't look intentional and what Saunders and Furbush said after the game just strengthens that belief. On the offensive side of things, the Mariners started off with a bang, with Franklin Gutierrez and Mike Morse coming up with a pair of solo home runs in the top of the first. After that, Milone's change up got the best of them. Milone settled down after the first and made Seattle's offense look like the Houston Astros trying to hit Yu Darvish. As far as offense is concerned, there wasn't really much else to talk about. Jesus Montero hit a couple of singles and Brendan Ryan got a hit, so yay! Thursday's game I didn't watch much of, but I saw the first few innings. Brandon Maurer looked exactly like what you'd expect. A 22 year old kid who hasn't pitched above Double-A trying to figure out how to subdue major league hitters. To his credit, he made the adjustments he needed to make, but so did the Oakland hitters. In the first couple of innings, Maurer was getting hit and most weren't just luck. The home run he gave up to Reddick in the bottom of the first was, put plainly, a Noesi type mistake. No, I don't think he'll make that a habit. His adrenaline was probably through the roof and, like all pitchers, he made a mistake. He left a 2 strike pitch over the middle of the plate, belt high and Reddick showed him why that's probably not such a good idea. Overall, it's no wonder he made the team out of spring training. Just keep in mind that he's a rookie and growing pains will be inevitable the rest of the season. He managed to make it through 6 innings, but gave up 6 runs (6 earned) on 8 hits, no walks and 1 strikeout. The offense was about what it was for Wednesday's game. Not a lot happened and Griffin made Seattle look silly. Speaking of silly, Robert Andino has looked a little lost at the plate in the two games he's played. Yes, it's only two games, but you have to be picky because of the lack of anything else to point out. I don't think that's anything to be concerned about since, again, it's only been two games. Morse checked in with another homer in this game to bring his total to 4 on the season, which is grand. His RBI total is 6, which is not. That's not a big deal since it's only April 4th, but it's slightly disconcerting that nobody is ever on base when he hits the ball over the wall. I'll be more concerned if he gets to 10 homers and only has 15 RBI or something, but right now, it's just a blip on the radar that you can point at and yell to nobody in particular, "Hey, a blip!" Kelly Shoppach started the game today, which I found slightly odd since his track record has been his inability to hit right handed pitching. Another blip! Overall, it was a good series, in that we got to see what the offense and pitching has the ability to do this season. Since going undefeated for an entire season is next to impossible, the losses just served as a reminder of why we're excited about the new offense. It's like a "See guys, this is what we can be compared to what we were", is what I'm trying to convey. We get to see the Oakland Athletics 547 more times this season, so that's also exciting. The most exciting pitcher in the rotation, Blake Beavan, goes up against Jose Quintana and the rest of the Chicago White Sox at 5:10pm Pacific on Friday. Here's hoping the baseballs aren't as slippery in Chicago.